Henry and I adore this mare, she is an absolute dream mare for a breeder! Diva gets in foal easily and so far has only given us fillies, what more could you ask for? 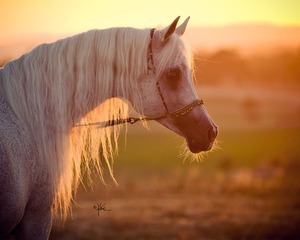 She is so appropriately named by her breeder Janice Bush of Somerset Farms and now Kehilan Arabians. In fact, Henry is convinced this familie's personalities are just like Janice, feisty and humorous! 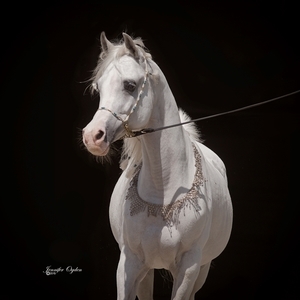 *Hoda is one of the several branches for the Hadbah Enzahiya Family that was imported to the United States, she is the great great grand dam of Diva. The other SMF branch came through the mare *Maysouna but they both trace back to the mare Bint Samiha and then to the mare Venus who originated this family in Egypt. In Europe there is the Kamla branch at El Thayeba, owned by Cornelia Tauske. A Marbach there were the Yosreia Branches and *Simeon Shai+ came from the Bint Rustem Branch at the Hungarian Stud of Babolgna. Today, it is more common to find the other family branches here in the US but this is a bit of their history in a brief summary and the Family is still breeding on at the EAO too. We like very much how Diva blends so well with Ali Saroukh; the influence of Ruminaja Ali and his full brother, Ruminaja Bahjat, in their pedigrees along with the Ansata Shah Zaman, is a positive for maintaining type. Not only is their the strength of exceptional stallions but the mares in this pedigree read like a whos-who of Egyptian horses. Mares of historical significance, Bint Maisa El Saghira, Magidaa, Ansata Bint Mabrouka, Moniet El Nefous and Cleopatra, all mares that founded family dynasties breeding onward today with great consistency. When Henry and I partnered with Janice on a full sister of Diva's, named Simply Seductive, we planned on each of us breeding her for our individual programs. However, fate was not kind and Sophie, as we called her, was unable to give us foals. So, Janice went to the owner of Sophie's full sister Dance Diva, asking if they were interested in selling the mare and the rest is history as they say! Diva is a tall mare, very balanced with large dark eyes and charisma plus!! Her production speaks for itself; six daughters of which we have the two year old Danikah by Ali Saroukh who is foal for 2015 to Symbolic SMF. The third Saroukh daughter, Dahlia, 2013 unfortunately died at about eight months of age and the other full sister Dance Delight was sold to Jordan but did not live long due to an accident there. Diva has also produced three beautiful daughters with *Simeon Shai+, Shai Exotica SMf is in Israel and has an impressive show career as well as carrying forward this families' abilities to produce exceptional foals. The other two Shai daughters are owned by Mideasterners. Delilah SMF (the only chestnut), lives in Jeddah KAS and Dance Divine SMF will be leaving in 2014 to go home to her owner Mohamed Jaidah, of Al Jood Stud in Qatar. We have one daughter of Dance Divine SMF appropriately named Divine's Gift, by Ali Saroukh. 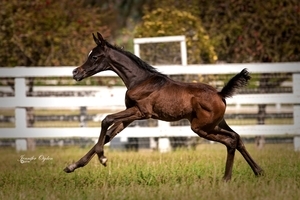 Only three times has Diva slipped foals and they were all colts. We would have loved to see what she produced in a male but that does not seem likely. She will be bred this year to Hajji Bekeer SMF (Majestic Noble SMF x Haalani SMF by Ali Saroukh), any resulting foal will be Hadban pure in the strain with both sire and dam being the same family but from different branches.